1. 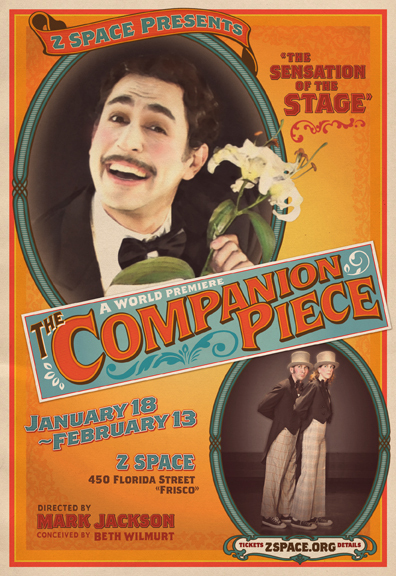 The Companion Piece at Z Space : Director Mark Jackson, and performers Beth Wilmurt, Chris Kuckenbaker and Jake Rodriguez are among the most captivating theatre artists in the Bay Area. This world premiere devised theatre production is hilarious, physically exhilarating (the actors probably burn off a thousand calories apiece doing everything from tap-dancing to shifting furniture to gnashing their teeth like Victorian fairground automata) and in places deeply moving. There is no plot as such. The production, which explores the love-hate-inducing push-pull inherent in both human relationships and the theatre-making process begins and ends in the same fashion - with a solo monologue by Rodriguez in the guise of a 19th century Vaudevillian. The middle hour of the action centers on a bunch of technically amazing comedic "bits" by double-act Wilmurt and Kuckenbaker. The production works best when it moves fast and stays focused on the tension between the theatricality and competing desires of the comedians. Where it falls flat is towards the end, when things take a low and serious turn. An overly-long "ballet" involving a couple of theatrical step-ladders is the chief cause of the problem. But The Companion Piece is in many ways vital and inspiring and totally worth seeing. The show is only on for one more weekend. I strongly advise anyone who's within driving distance of the Bay Area to see this show. The performers have not been getting as good audiences as they should, which surprises me immensely: Usually any production involving Jackson and Wilmurt comes close to selling out if not sells out entirely. And this is one of the duo's finest collaborations to date. 2. Program 2 at The San Francisco Ballet: The mixed program looked promising with its two classical repertoire standards -- Sir Frederick Ashton's Symphonic Variations and George Balanchine's Symphony in C -- bookending Yuri Possokhov's new world premiere, RAkU, based on Japanese themes. All three pieces on the program are linked by the post-war years: Ashton and Balanchine's ballets were created in 1946 and 1947 respectively, and RAkU deals with the burning of Kyoto's Golden Pavilion in 1950. The contrast between the two quite similar abstract works created to show-off dancers' perfect lines and test their stamina and Possokhov's dramatic narrative ballet made for a tidy, A-B-A structure to the evening. But beyond that, I found the programming to be mostly unsatisfying. Ashton's steps came over as fussy and mincing; at the start one or two of the dancers seemed to be experiencing technical difficulties (also known as "the wobbles") and could not keep the requisite glassy poise to make the dance feel as seamless and perfect as it should. Balanchine's piece was the most lively of the three on the program. The dancers looked like they were floating on air. When the entire cast was on stage at the end of the piece, I felt as if I were watching a thousand human forms refracted in dozens of mirrors or the panels of a perfectly-cut diamond. For me, the weakest part of the program was RAkU. The piece came across as "Asiatic drag" with its flapping kimonos, Japanese instrument-flecked musical score (by SF Ballet bassist Shinji Eshima), and choreography which seemed to my mind to evoke Japanese Zen traditions in the most superficial way. It also struck me that the piece bore too much of a resemblance to John Neumeier's The Little Mermaid, created for SF Ballet's 2010 season, which also draws on Asian themes and makes use of the talents of the company's most ethereal and waif-like ballerina, Yuan Yuan Tan. "All I could think of as I watched the piece was that she should eat a sandwich once in a while," said my friend Nori during intermission after witnessing the tiny dancer die a tragic lover's death in RAkU. 3. Hot Air Festival at the San Francisco Conservatory of Music: I managed to catch only the first hour of this second annual festival devoted to performances of music written in the last 50 years, but I'm glad at least to have had a glimpse of the event. The festival, which went from 2-10pm, featured a plethora of performances of pieces by well-known and established composers as well students. An amplified cello piece by Michael Gordon, Industry, almost gave me a migraine with its interminable scrapings. The work did sound like heavy machinery, so I guess the title is a good one. But it was stultifyingly dull and exhausting to listen to. Things improved radically, however, with a lively performance of Lou Harrison's Concerto for Violin and Percussion Orchestra. The piece is 50 years old today, and the SF Conservatory musicians (including a charismatic student, Kevin Rogers, on violin) gave a great deal of resonance to Harrison's arcing arpeggio string melody and mellifluous, Eastern-tinged percussion. The piece was also great fun to watch. Percussionists Doug Chin, Kevin Schlossman, Zachary Singer, Jacob Steuer and Kevin Villalta moved seamlessly between a variety of instruments including crotales, bass drums and found instruments like flower pots and tin bath-tubs. The last piece I heard before I had to leave was the second movement from Osvaldo Golijov's Dreams and Prayers of Isaac the Blind. The Classical Revolution String Quartet and clarinetist Morgan Nilsen played voraciously, bringing extreme excitement to the Klezmer-infused harmonies and spiraling melodic lines. I was completely swept away by the sense of ensemble and gusto of the musicianship. Magnificat Baroque Ensemble's Donne Virtuose program at St. Luke's Church: A knock-out program of works by 17th century women composers featuring the ardent, beveled singing voice of Jennifer Ellis Kampani, whom I am beginning to adore almost as much as Lorraine Hunt Lieberson, my favorite vocalist of all time. The musicians, led by the group's artistic director, Warren Stewart, all looked like they were having a blast while playing. The music was varied and rich, involving everything from a heartfelt sacred song ("Volo Jesum") by Isabella Leonarda to La Passage de la Mer Rouge, a colorful and dramatic cantata by Elisabeth Jacquet de la Guerre, to gorgeous secular pieces by Francesca Caccini and Barbara Strozzi. A few weeks ago, Warren appeared on VoiceBox, my weekly public radio show all about singing and vocal music, to talk about this repertoire. I fell in love with it then and am completely obsessed now.